On December 23, 2014, Professor Steven Gillette received an impressive gift for the Mechatronics program at Sierra College. The gift was a check for $10,000 from Inductive Automation, specifically donated to support the implementation of supervisory control and data acquisition (SCADA) software in the Mechatronics program. The introduction of SCADA controls in the Mechatronics program will open the door to many quality employment opportunities for our students,” said Professor Steven Gillette. Inductive Automation is a Folsom-based developer of automation control software serving large industrial processes such as oil and gas refineries, water treatment, and power generation facilities. Professor Gillette was originally contacted by Cynthia Gallegos, a Human Resources Assistant, regarding the company’s participation in the CTE (Career and Technical Education) job fair held at the Sierra College Rocklin Campus last semester. Gallegos’s enthusiasm to participate in the job fair piqued Professor Gillette’s interest and he made a point to visit the Inductive Automation booth, and later attended a company presentation at their corporate headquarters in Folsom. While there, Gillette met with Carl Gould, Co-Director of Software Engineering, to inquire about the employment potential for Sierra College Mechatronics graduates with Inductive Automation. He also suggested a collaboration with Inductive Automation in support of the Mechatronics program goal to train automation technicians. Another meeting was then set up at the Sierra College Rocklin Campus Mechatronics lab with the Inductive Automation Human Resources Director, Albert Cayabyab; Gallegos; and the company's Director of Training, Travis Cox. At that meeting, Gillette demonstrated a potential application for their SCADA software related to Sierra College’s eight-station Sun Trainer system, a small automation system that processes compact CD’s. Professor Gillette noted that the training system would require upgraded programmable logic controllers (PLCs) costing approximately $8,000 in order to communicate with Inductive’s Ignition SCADA software. 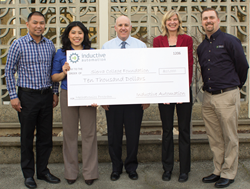 Inductive was excited about the possibility of introducing their advanced automation controls system to Mechatronics students, and offered to donate an academic software license valued at $15,000 for the program’s use in the classroom. Later Gillette was surprised and delighted when Gallegos contacted him with an offer to donate up to $10,000 to upgrade the PLCs used by the program. Professor Gillette received the check on December 23. What a great Christmas present! Gillette plans to task students in his spring 2015 Mechatronics Systems class with the installation of the new hardware and software as a part of their lab experience. “I am very excited to introduce this level of automation control technology to our students. SCADA technicians frequently earn up to $100k per year. The introduction of SCADA controls in the Mechatronics program will open the door to many quality employment opportunities for our students,” said Professor Steven Gillette. On Thursday, January 8, a group from Inductive Automation including Cox, Cayabyab, and Gallegos returned to the Sierra College Rocklin Campus to meet with the Foundation Director, Sonbol Aliabadi, and Sierra’s President, Willy Duncan, and to pose for a photo with a giant check, representing their generous donation to the Mechatronics program.